ALL OUR WK BIKES AND SCOOTERS NOW COME WITH A 2 YEAR WARRANTY! All our brand new scooters and motorcycles come at least with the usual 1 years manufacturers warranty which covers parts & labour** which are deemed faulty and not failing due to general wear and tear or abuse/tampering. It is important to bear in mind that not keeping the bike/scooter clean and free from muck will only aid corrosion and parts will not be classed as faulty so please keep your bike/scooter in good condition which forms part of the warranty stipulations as found in the service book. Other important factors include ensuring the motorbike / moped is serviced as per the warranty book. If you have any questions regarding the warranties please get in touch. 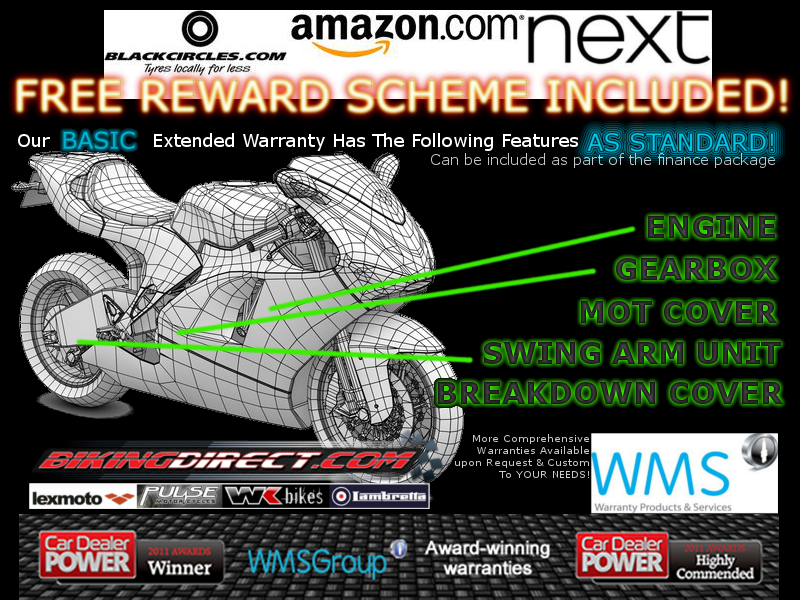 We offer many alternatives or additions to a manufacturers motorcycle warranty, in fact, we can put a warranty on any Bike or scooter whether it be Chinese, Japanese, German or Italian etc, please see the charts below for an idea of what each warranty covers, and what the cost is. Our extended warranties all include brakedown cover as standard. Motorcycle Warranties that offer peace of mind which are customisable to your needs. Roadside assistance – Roadside repairs – Assistance at your home – Onward destination service – Cover for any rider / driver whilst using the vehicle insured, provided the rider / driver has the owners permission – Cars, vans & motorcycles up to 3.5 tonnes – Caravan or trailer attached to your vehicle up to 25 feet long – One hours roadside assistance only – Up to a maximum of six call outs a year – (four call outs a year for taxis/hired vehicles/courtesy cars) Wheel change provided member has a serviceable wheel & tyre & key for locking wheel nuts or inflation kit provided & cab be used to allow you to complete your journey. Roadside assistance – Roadside repairs – Vehicle recovery to an approved repairer – If the vehicle cannot be repaired on the same day as the breakdown vehicle recovery with rider / driver & up to 4 passengers within the territorial limits – Hotel accommodation (Maximum £500 per claim or the cost of hiring a replacement vehicle maximum seven days hire) – maximum period of cover 28 days per trip. See terms & conditions before purchasing. You won’t find better Hence why we are SHOUTING ABOUT IT! When you purchase a brand new bike from Biking Direct, it will come with a 1 or 2 year warranty as standard and free of charge (Pulse, Lexmoto & Lambretta come with 1 Year Warranty as standard, WK Bikes & Scooters come with a 2 Year Warranty as standard). 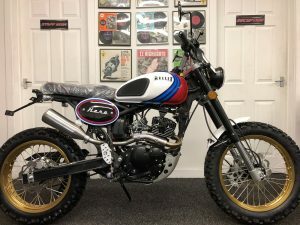 This is the manufacturer’s warranty – this warranty, although it covers faults with the bike itself, does not include any of the perks you would receive with even the most basic extended warranty from us (such as breakdown cover & Labour) Others offer similar warranties, (extremely basic and not underwritten – being underwritten means you are more protected) but nobody offers the level of cover that we do. Our basic 2 year warranty extension won’t empty your bank account and will give you more peace of mind. Swing arm unit (which covers all bushes and components within the swing arm unit). MOT Cover: This cover ensures that when your bike is due to be MOT’d any issues will be fixed under the warranty! How Good is THAT? Breakdown Cover: The cover will ensure your bike/scooter is collected & delivered to the nearest garage within 10 miles. ASK OTHER SELLERS FOR FULL WARRANTY INFORMATION – OURS IS BY FAR THE BEST! For £159 (Includes ITP & FSA Admin Fee), you will not find a better or more comprehensive warranty for your beloved motorcycle/scooter! And if you are going down the finance route, we can include the cost of this in the finance so you don’t have to fork out for it! As an added bonus to our customers it will also come with a free rewards scheme (similar to Groupon) saving you up to £1500 a year on holidays, shopping from over 10.000 sites & companies including Black Circles, Next, Amazon etc! Our products won an award for 2012 of ‘Best Warranties 2012’. 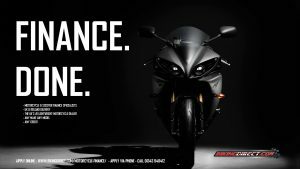 We supply all our warranties at Trade Price, we pass on the savings to you to ensure you get the best motorcycle experience possible, and that little peace of mind certainly does help.